I aim to keep my kayaking posts upbeat, but I also want to keep things real. In that spirit, let's talk about some of the things that didn't work so well for us this season. People: I was excited to join the East Hampstead Kayaking MeetUp Group this year so we could meet new paddlers and try new places. They turned out to be a great group of friendly people and we enjoyed our early season paddle on Dubes Pond with them. But in the end, the group didn't work out for us. They tended to favor longer paddles of 3 to 5 hours and many trips were scheduled at night or on Sunday mornings -- just not a good fit with our kayaking style. If this sounds like your style, however, definitely check them out. Places: Our least favorite kayaking excursion this season was the 9-mile section of the Contoocook River we did with the East Hampstead Group. We paddled steadily for 3.5 hours and saw mostly high (eroded) river banks and very little wildlife. In this case, we were shuttled to the put-in and had no option but to keep paddling to the take-out. (Next time we take a shuttle, we'll check the distance more carefully.) Thank goodness it was a beautiful summer day and we were with a nice group of people! I read afterwards that the boat is considered "unrescue-able." He was able to save the boat probably because he was so close to shore, but things probably would have turned out differently if he had been out in the middle of the river. There's a makeshift solution to this problem and that is to fill the open cockpit with inflatable bags sold for that purpose. We might try that next year or we might start shopping for new boats, if we can afford them. If you have a favorite brand or model, please write in and let us know. We would love to get suggestions! Wow! Did our kayaking season fly by or what? I can hardly believe it's time for our annual "picks and pans," but sadly, Mother Nature seems to be telling me it's time to hang up our kayaks until next year. And so I'm presenting a round-up of our favorites for '09. Best Close to Home (in southern NH) -- I have to say the Nashua River exceeded my expectations. We kayaked the Nashua Canal once before and were "underwhelmed." The River is a whole different story. Due to our little misadventure on the River, we didn't get to paddle to Hollis, nevertheless, we saw lots of wildlife in the short section we explored and will definitely be returning next year. 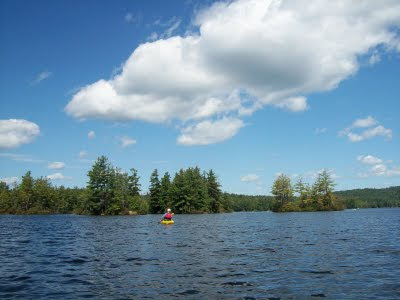 Best Early Season Paddle -- Dubes Pond in Hooksett (10 minutes outside of Manchester) is still a favorite, best paddled early in the season before it becomes choked with vegetation. This place is fairly quiet; we've never seen any motorboats here. We always enjoy exploring the small marshy inlets and watching the large variety of birds -- even if I can hardly identify a single one! 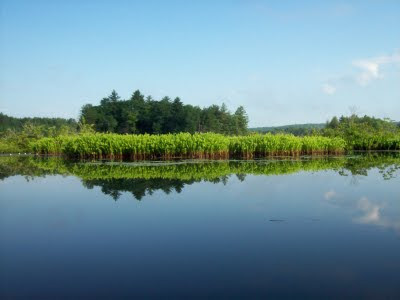 Perennial Favorite -- Gilmore Pond in Jaffrey is still near the top of our list. Part of me wants to stop talking about it so it will remain quiet and pristine -- and the other part of me wants to share it with everyone. To be honest, if you're a "Type A" paddler who likes to stay on the go, this small pond probably isn't for you. But for us, Gilmore is the perfect spot to drop in a fishing line or just sit and watch the loons. New Favorite -- Grafton Pond in Enfield was our hands down favorite this year. It has lots of islands and nooks and crannies to explore and is set against the backdrop of distant mountains. We also encountered four loons here. It's quiet paddling at its best and is large enough to keep you kayaking for hours or to invite many return trips. So there you have it...a quick roundup of our 2009 favorites. I'm going to write another short post soon about some places and experiences that didn't work so well for us this year. Don't get me wrong, we always enjoy our time on the water -- but what can I say? We all have likes and dislikes! So I've been sidelined with a back problem (again), which has me applying ice packs, waiting it out, and hoping I'll be able to kayak or bike a few more times before the snow flies. But then I stumbled across this quote and it got me thinking about ways to enjoy the outdoors, no matter what: "Life isn't about waiting for the storm to pass; it's about learning to dance in the rain." Granted, having back problems is a tiny storm in the big scheme of things and I'm usually not one to wallow. But I guess I was temporarily stuck in the "I wanna" mode, as in, "I wanna kayak." Sunday I decided to get unstuck, so we got in the car and headed to the town of Jaffrey just to explore. My inspiration for this little side trip was an article about the Monadnock region in New Hampshire magazine. They pointed out some landmarks in Jaffrey that we'd driven by many times on our way to Gilmore Pond, but had never stopped to notice. First off, there's a river that runs on the west side of Main Street. Could it be the Contoocook or is it the Ashuelot? I couldn't find the answer, so please clue me in if you know. Below that is a reflection of the Meeting House (built in 1775) in the window of the Little Red School House. These buildings are both located in Jaffrey Center, the historic area just west of downtown. I was captivated by Cather's books as a kid, including My Antonia! and Oh Pioneer! I knew she was from the Midwest -- Nebraska, to be exact; so it seemed odd to learn she's buried here. But I found out she spent summers writing her books in Jaffrey, in a tent at the base of Mount Monadnock. I didn't get a good picture, but her headstone has pens and pencils that visitors have left behind. So there you have it. A brief photo tour of Jaffrey, a lively, welcoming little town in the southwestern corner of the state. 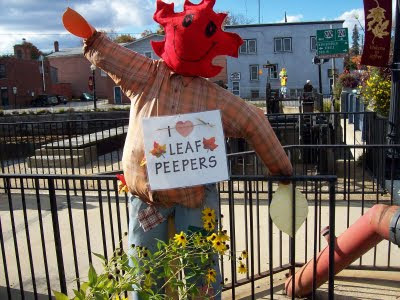 Almost forgot to mention, the Main Street was lined with so many scarecrows they looked like spectators lining a parade route. Sometimes dancing in the rain can be fun! Our cool and rainy weekend makes me want to light the backyard firepit and toast marshmallows. How about you? Shorter daylight hours can only mean that our kayaking and biking season is quickly coming to an end. I'm hoping to take at least one more kayaking trip before we hang up the boats for 2009 and maybe a couple more bike rides -- if my back/hip problem improves...we'll see. The good news is fall in New Hampshire is really beautiful! And there are so many festivals, fairs, hikes, and scenic rides to choose from that there's no reason to hibernate just yet. 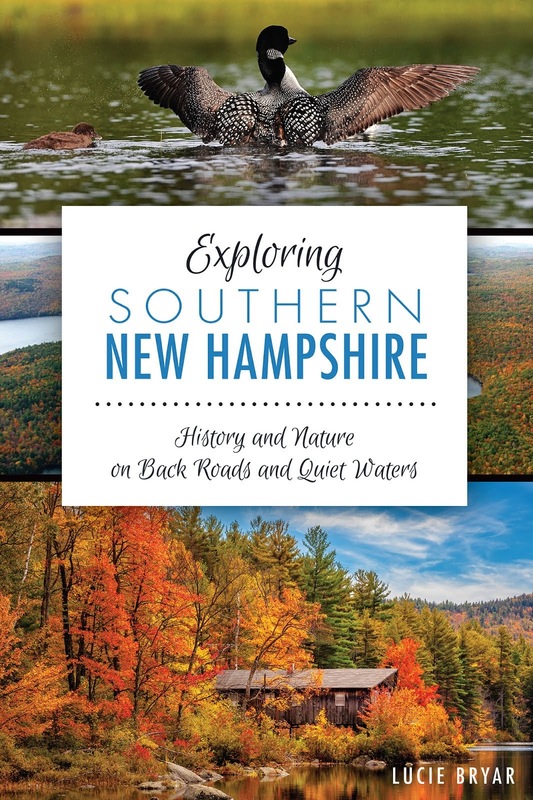 I've been busy "tweeting" about some of these New Hampshire outdoor events on Twitter -- check it out at ExploreNH or follow my Tweets right here on NH Love It or Leaf It; Scroll down a bit and they're in the right sidebar. 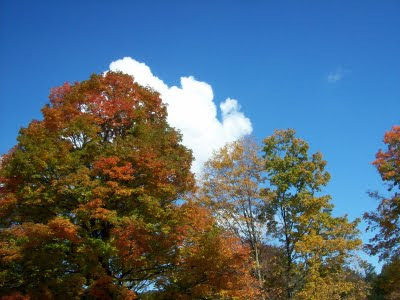 Anyway, I'll climb down from my soapbox now and leave you with this short list of websites with great information about fall activities in New Hampshire. Hope you find inspiration and motivation to get out there and enjoy our beautiful state before the snow flies! http://www.nh.com/ has a pretty decent events calendar and highlights special activities on its homepage. Once upon a time (like several months ago), I was a featured blogger there, but I haven't had the time to post recently. Amazing...but they've managed to survive and thrive without my enlightening posts! http://www.newhampshire.com/ lists lots of events and activities going on throughout the Granite State. They just started a new calendar called NH365. In my opinion, the search engine is clunky, but if you're persistent -- there's good information here. http://www.visitwhitemountains.com/ is a new discovery for me, thanks to Twitter. I love the look and feel of this website. So user-friendly and definitely has worthwhile information if you're visiting the Whites.